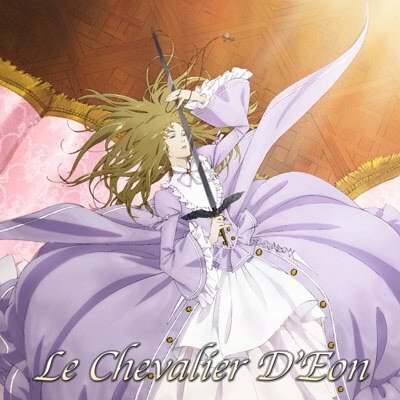 Le Chevalier D’Eon is a Mystery/Horror anime based on the manga by Tow Ubukata and published by Kodansha. Del Rey produces the American manga. The 24 episode anime comes to us from Studio I.G. and is currently licensed by Funimation. It originally aired from August 2006 to February 2007. The story begins in Paris, 1753, when the body of a woman named Lia de Beaumont is found in a casket floating along the Seine. The only clue regarding her death is the word "Psalms", which is written in blood on the lid of the casket. D'Eon de Beaumont, Lia's younger brother and a knight in service of King Louis XV, takes it upon himself to investigate his sister's mysterious death, along with the strange disappearances of a number of French women. In his journey he comes across three companions to help him. Lia's body, however, was found to be infused with mercury, making it unable to be decomposed. The Church, declaring that, because she could not return to the "dust she had come from," refused to let her be buried, saying that her soul would forever wander, never able to go to heaven. D'Eon, angered by this, also uses it as a drive in his investigation. Lia, however, still feels the need to avenge her death, and so, when D'Eon is in battle, she can sometimes possess his body and fight. The look and animation of Le Chevalier D’Eon is fairly well done. Since this is a historical anime, you have to make sure the look isn’t too harsh or in your face, as well as depict the locations of France, Russia, and England accurately; and this anime does this very well. Also, since this is a mystery story, the atmosphere and the mood have to be set very well at the right time. Occasionally, there are times where a certain mood is completely wrong for the scene, but it doesn’t take too much of a toll on the series as a whole. On the downside of all the technical pieces of it, the animation can be a little bit taxing sometimes; mostly when it comes to a character’s face. A lot of times, the expressions seem a little distorted, especially when a character is either sad or in pain; and ESPECIALLY for Durand. He seems to be the biggest target for messed up facial expressions, and it kinda takes away from the series a little bit. The plot of the anime isn’t historically correct at all, but it does make for a good story. The story seems rather simple, Lia is found dead and her brother D’Eon is trying to find out who killed her. By the time you get to the end of the Russia trip (which is about episode 13), you believe you know who it was and you think the series would be over...... Nope, you still have twelve more episodes to go till you finish the series. Now there’s something called the “Royal Pslams” or some silly thing that they’re trying to get back to Louis XV now. You’d think the story should have ended, but nooooo it has to keep going because it wants to confuse the living daylights out of you. But overall, despite some flaws, it makes for a very interesting and mysterious story line that will keep you guessing. The series takes a lot of the historical facts and puts them to use in the series. Obviously, the members of the royal family in France, Russia, and England are real, but there are other actual facts in the story. For instance, D’Eon de Beaumont was a real person. He was a French spy who worked for Le Secret du Roi, the secret organization D’Eon and his companions are a part of in the anime. However, he did not have a sister who died and possessed his body, people believed he was actually a woman at birth instead of a man. Other real life figures the story uses, loosely, include: Marquise de Pomadour, Duc d’Broglie, Duc d’Orleans, Comte de Saint-Germain, Vorontsov, Count Cagliostro, and Lorenza. There are so many characters in the series it is crazy! You not only have D’Eon and Lia, but you have their three companions, characters in France, characters in Russia, characters in England, the bad guys, one time characters, reoccurring characters, characters merely existing to show off their funny hats..... Good grief you don’t even wanna know how many big characters are in the series. Because of this, the character development isn’t really there. Throughout the series, D’Eon is the only one with any real big development. Durand, Robin, and Taillagory (D’Eon’s companions) have little development, but towards the middle (Durand) and the end (Robin and Taillagory), there seems to be last minute things thrown in. No other major characters have much development. As a matter of fact, a few minor characters have more stinking development in the series. Katerina of Russia is one, Lorenza is another. It’s kind of bothersome when your minor characters go through a lot more then your major characters. In regards to picking a language to view the series in, I highly suggest the English dub for two reasons. One, D’Eon sounds more mature and Lia sounds a little less angry and crazy. Two, the story takes place in France, Russia, and England.... It makes no sense to listen to the Japanese audio if this is where the story takes place. With that in mind, the voice acting in general for the English dub is done by a rather strong cast. David Matranga (High School of the Dead, Canaan) as D’Eon and Taylor Hannah (High School of the Dead, Red Garden) as Lia, as I said before, are much stronger choices then their Japanese counterparts. Tyler Galindo, Illich Guardiola, and John Swasey as Robin, Durand, and Teillagory are very good choices as well; the best being Illich Guardiloa’s Durand (D.N.Angel, Kiba), even though his face looked like he was in torture from time to time. Other well known voice actors you might recognize are: Jay Hickman (Princess Tutu) as Louis XV, Hilary Haag (Trinity Blood) as Belle, Brittney Karbowski (Soul Eater) as Anna Rochefort, Shelley Calene-Black (Canaan) as Marquise de Pompadour, Jessica Boone (Canaan) as Katerina. And here’s one you might not expect: Vic Mignogna is the voice of Sir Dashwood. There will be a character every now and again that irritates the living crap out of me (Peter III... ugh) but it makes me feel better when they’re gone (He he, Peter gets hanged). The real big character that I truly find believable is Marquise de Pompadour. She not only is a woman pushing for a movement, but at points she sounds more French then any other character that is even related to France. I know last time I mentioned Shelley Calene-Black I didn’t mind her performance as Canaan, but this clearly makes up for it in spades! As an end product, Le Chevalier D’Eon is a loose historical depiction of France before the revolution, adding mystery and supernatural into the mix. Although some poor technical choices were made, the overall series doesn’t completely fail. The English cast was picked carefully, with real good results.... most of the time. But, over all, it’s a must see. The mystery is there; The supernatural is there; The history is there, loosely, and it’s a good watch if you like adaptations of historical events and people that, maybe could have happened, but obviously didn’t.